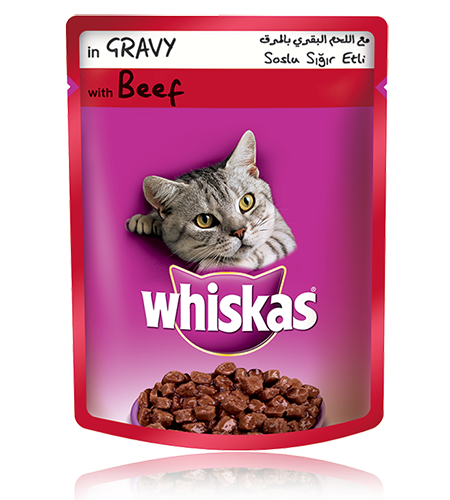 We put quality beef in our recipes not only because cats love it but also because it is a great source of natural protein, vitamins and minerals, and by the time we have cooked it in our delicious gravy, it tastes great too! Gravy - Thickening agents (Modified Starch, Vegetable gums) and Water 49.98%, Animal origin - (Chicken, Liver, Beef, Meat by products) 48.34%, Food additives (Natural flavour , Sodium tripolyphosphate, Salt, Taurine, Disodium EDTA) 1.01%, Soy bean oil 0.35%, Vitamins and minerals 0.31%, Coloring & Color Fixative agents (Color, Sodium nitrite) 0.02%. 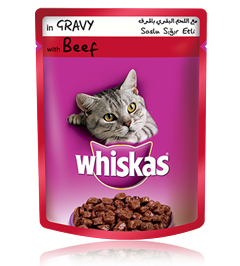 Whiskas® pouch with Beef in Gravy is formulated to meet the nutritional levels established by the AAFCO cat food nutrient profiles for growth and maintenance.